Sierras Pampeanas Eastern Geological Map. Name(s) in local language(s): Mina La Bismutina, Departamento Minas, Provincia de Córdoba, Argentina. La Bismutina Mine. Elevation: 1,014 m. above sea level. In the Sierras Pampeanas Eastern the Famatinian orogen is a Crystal belt of 350 km long and 175 km from half-width. This strip attributed to the Middle Cambrian period - Carboniferous early sobre imposes on the metamorphic basement - igneous pampas of Córdoba and San Luis, to the West of 64 ° 45' West longitude, numerous polymetallic deposits (W, Ag, Pb, Zn, Au ± Cu, Bi, Mo, Ag, Pb, Be, Sb, U, Ta, As), mostly related to post colisionales granitoids. The Devonian mineralising episode medium - late Carboniferous, shows a linear domain in the distribution of their mineral concentrations, with pronounced absence of isometric morphologies. Mineral deposition took place after the tectonmetamorfic orogen peak (~ 465 Ma), the stage of evolution in late Famatiniana, or at the beginning of the Achaliana orogeny. 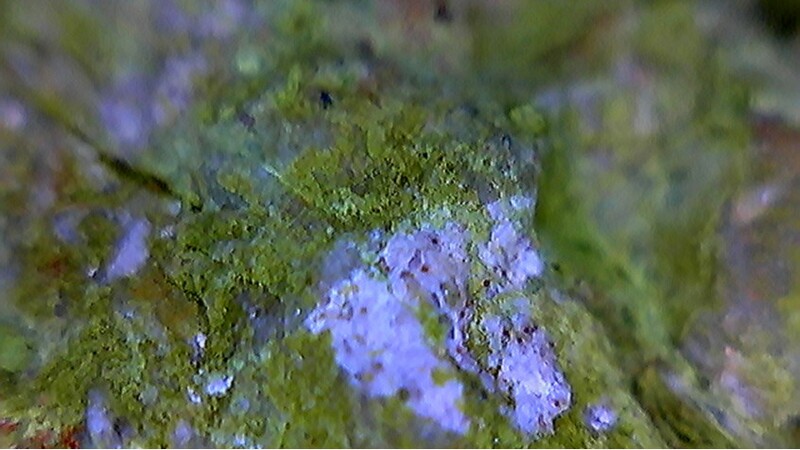 Mesotermales polymetallic deposits exist or stylish veins in areas of shear, concerning the stage of noble metals, sulfides and Sulfosalts mineralization. These concentrations, selected by its representation space and paragenetic, are in San Luis districts San Martín (W), Los Cóndores (W) , Las Aguadas (Ag, Pb, Zn) and San Bernardo (Ag, Pb, Zn) and Córdoba districts Candelaria - San Ignacio (Au), Agua de Ramón (W), La Bismutina (W), Ambul (W), Cerro Áspero (W) and El Guaico - La Argentina (Ag, Pb, Zn). Sierras Pampeanas of San Luis and Córdoba present numerous anomalous concentrations of W, Ag, Pb, Zn and Au, constituting a linear domain of deposits and manifestations of disseminated between 64 ° 45' and 65 ° 45' West longitude. The domain continues within the Argentinean territory to the North, in the provinces of La Rioja, Catamarca and Jujuy. These metal concentrations have a complex geochemistry characteristic in common, given by varying proportions though subordinate in: Cu, Bi, Mo, Sn, Sb, As, V, Sb, Cd, Be, U, Ta, and Mn, highlighting a persistent presence of gold with values greater than 100 ppb. Au values between 0.2 and 26 are cited in this regard, constant, WO3 between 0.1 and 5%; Pb between 0.24 and 16%, between 0.2% and 11% Zn and Ag between 5 and 326 constant for the samples districts. Researched polymetallic mineralization is hosted in Pampa metamorfites medium-to-high grade: paragneises, paraschists, migmatization and conditionally, ortoamphibolites, marbles and rocks calcosilicates, retrogradados during the late orogen to green shale facies. In the Agua de Ramón, Cerro Áspero districts San Martín y Las Aguadas, located also in granitoids assigned to the Orogen or Achaliano, as the Agua de Ramón, Rodeo Viejo tonalitas or the Cerro Áspero monzogranites. The tanks have a complex metalliferous paragenesis, systematically in ganga majority of quartz and multiple episodes of deposition-related at the level of district, Lode or vein. 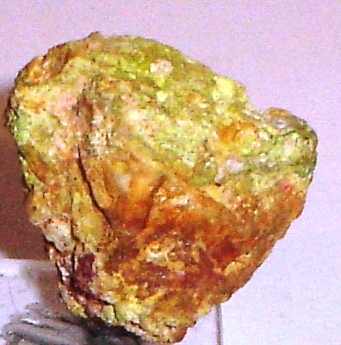 This paragenesis is represented by oxides, sulfides and Sulfosalts, along with native gold, although the proportion of sulfides and Sulfosalts base metals is low and is estimated < 10% in number of mineralized in the basement rock. Found morphology of the mineralized bodies is swarm of veins, veins and veins, veins as a decametrics and sashes of the order of km of extension. 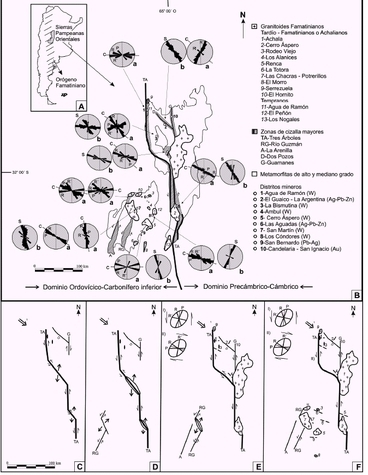 Predominate sub-vertical bodies intertwined with stepped structure games at echelon, although occasionally are bodies mantiformes to submatching with the rock box for example: La Bismutina, Ambul and Cerro Áspero. Veins rarely exceed the power meter and 100 meters of extension. 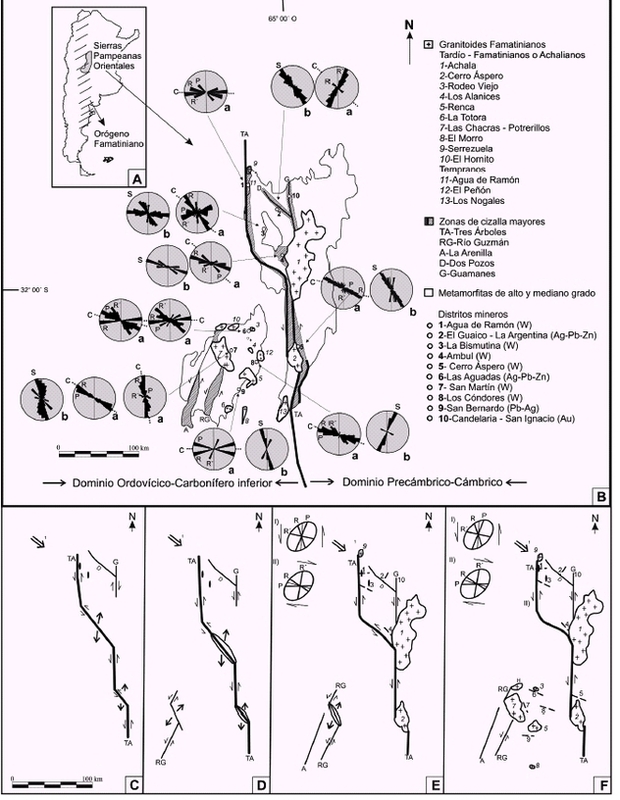 La Bismutina Mine, Córdoba: mineralization in veins set and inclined with Ferberite, Scheelite, Chalcopyrite, Bismuthinite, Molybdenite and Pyrite as primary minerals; children include Malachite, Bismutite, Ferritungstite and Jarosite; the main ganga is Quartz. D. Mutti, A. Di Marco y S. Geuna (ene./mar. 2007). Depósitos polimetálicos en el orógeno famatiniano de las Sierras Pampeanas de San Luis y Córdoba: fluidos, fuentes y modelos de emplazamiento. Departamento de Ciencias Geológicas, Universidad de Buenos Aires, Ciudad Universitaria, 1428 Buenos Aires. e-mail: muttix@gl.fcen.uba.ar. Revista de la Asociación Geológica Argentina versión On-line ISSN 1851-8249. Rev. Asoc. Geol. Argent. v.62 n.1 Buenos Aires. R. R. Fernández (1992). Composición de la wolframita y paragénesis del distrito La Bismutina, provincia de Córdoba. 1era Reunión de Mineralogía y Metalogenia. Instituto de Recursos Minerales, 2:99-106. R. R. Fernández (1999). El distrito minero La Bismutina, Córdoba. En Recursos Minerales de la República Argentina (Ed. E.O. 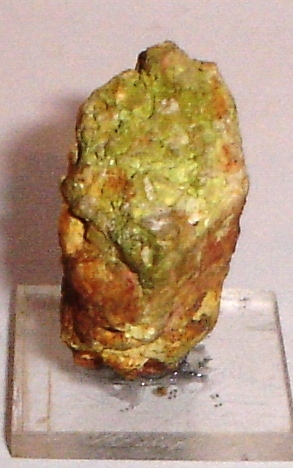 Zappettini), Instituto de Geología y Recursos Minerales SEGEMAR, Anales 35:443-448.